Introduction Recently (2011), the European Treatment and Outcome Study (EUTOS) scoring system was formulated to risk-stratify chronic myeloid leukemia (CML) chronic phase patients on imatinib treatment. CML during childhood is rare, making prognostication and management difficult. This study was conducted to investigate the cytogenetic and molecular response rates among EUTOS risk groups in pediatric CML patients on treatment with imatinib. Patients and methods Hospital records of pediatric CML chronic phase patients (age18 years) from 2009 to 2012 were analyzed retrospectively for demographic data, imatinib dose, date of initiation of treatment, EUTOS risk score, follow-up details, and cytogenetic and molecular response. Results A total of 57 children were included in this study, with a median age of 14.5 years (range: 5–18 years) and male preponderance (M:F, 1.19:1). The majority (67%) of them were in the low-risk group as per the EUTOS score and the remaining were in the high-risk group. Complete hematological response at 3 months was 100% in the low-risk and 94% in the high-risk group. Complete cytogenetic response at 12 months was 76 and 73% in the low-risk and high-risk groups, respectively. Major molecular response at 18 months was 85 and 79% in the low-risk and high-risk groups, respectively. Two-year event-free survival was 89 and 80% in the low-risk and high-risk groups, respectively. Conclusion The EUTOS low-risk cohort responded better than the high-risk cohort, but the difference was not statistically significant. Both groups had similar outcome at the end of 2 years. The EUTOS score did not predict the response and outcome in pediatric CML. Chronic myeloid leukemia (CML) constitutes 3% of pediatric leukemia cases, making evidence-based recommendations difficult. Imatinib is effective in children with CML in chronic phase (CP) with response rates similar to those reported in adults . Because the characteristics of CML in children seem to overlap extensively with what is described in adults, most of the pediatric algorithms are adapted from the treatment of CML in adults . Although there are several validated scoring systems for the adult CML population, none of them have been specifically validated in the pediatric population. Imatinib and second-generation tyrosine kinase inhibitors (TKIs) have revolutionized the treatment of adult CML CP, making allogenic transplantation obsolete as front-line treatment. The clinical approval of multiple BCR-ABL-targeting TKIs has led to a therapeutic dilemma for clinicians in assigning upfront therapy. In an endeavor to guide and optimize treatment decisions, several risk score metrics have been formulated and used clinically to gauge the likely disease outcome. The Sokal and Hasford (Euro) scores were developed in the chemotherapy (1984) and interferon eras (1998) but continue to be widely used. Recently (in 2011), a new scoring system called the European Treatment and Outcome Study (EUTOS) scoring system was formulated. We analyzed our data to evaluate the effectiveness of the EUTOS prognostic score in predicting the response and outcome in pediatric CML CP patients on front-line imatinib. Between the year 2009 and 2012, consecutive newly diagnosed children (≤18 years) with bcr-abl1+ and/or ph+ CML in CP who had received imatinib as first-line therapy were analyzed. The hospital records were analyzed for demographic data, spleen size, white blood cell count, differential count, diagnosis date, disease phase, EUTOS score, date of initiation of imatinib treatment, attainment of complete hematological response (CHR), cytogenetic response at 12 months, molecular response at 18 months, follow-up details, and outcome at the end of 2 years. Those who did not undergo evaluation as per advice were excluded. The primary endpoint was cytogenetic response at the end of 12 months and molecular response at 18 months of treatment. The secondary endpoint was event-free survival (EFS) at 2 years. The risk groups were compared statistically using the Fisher test. The EUTOS score was defined as 7×basophils+4×spleen size, where the spleen size was measured in centimeters below the costal margin, and basophils as a percentage at baseline. A EUTOS score of more than 87 indicates high risk and a score less than or equal to 87 indicates low risk. It was calculated using an online calculator on the European Leukemia Net website: https://www.leukemia-net.org/content/leukemias/cml/eutos_score/index_eng.html. All children received free imatinib under the Glivec International Patient Assistance Program. The drugs were handed over to the patients after their physicians' visit, on presenting the prescription at the local program coordination office. Drugs were issued for 3 months at each visit. All of the CML CP children were started on imatinib at a dose of 260 mg/m 2 after the parents/guardians had given consent for initiation of treatment. The study protocol was approved by the institutional ethics committee. All children underwent hemogram readings fortnightly until achieving CHR and monthly thereafter. Hematologic and cytogenetic response was defined as per the guidelines of the European Leukemia Net . Conventional cytogenetic analysis was performed in bone marrow cells using a G-banding technique. At least 20 metaphases were analyzed, and marrow specimens were examined on direct or short-term (24-h) cultures. Major molecular response (MMR) was defined as a BCR-ABL/ABL transcript ratio of less than or equal to 0.1%. Out of 68 children, 11 were excluded (because of nonavailability of cytogenetic response data in four and molecular response data in nine children). Fifty-seven children constituted the basis of this study, with a male preponderance (M:F, 1.19:1) and the median age of 13 years (range: 5–18 years). Patient characteristics are enlisted in [Table 1]. Thirty-eight (67%) and 19 (33%) children were in the low-risk and high-risk EUTOS groups, respectively. Complete cytogenetic response (CCyR) at 12 months was achieved in 79% of the low-risk group and 69% of the high-risk group. MMR at 18 months was achieved in 95% of the low-risk group and 79% of the high-risk group. EFS at the end of 2 years was similar (90%) in both groups ([Table 2]). The number of events found were four in low risk group (one lost CHR and three progressed to accelerated phase, AP)and two in high risk group (one lost CHR and one progressed to myeloid blast crisis, BC). Ideally, a study on the new CML prognostic score and its influence on the outcome should be performed prospectively on newly diagnosed patients with frequent hematologic, cytogenetic, and molecular evaluation and with prolonged follow-up. To conduct such a study on pediatric CML patients would be very difficult because of its rarity. We therefore chose to conduct this retrospective study on newly diagnosed pediatric CML CP patients on imatinib in whom we could study EUTOS risk groups and their response and outcome at the end of 2 years. In the present study, two-thirds of the children were in the low-risk group and constituted the majority. The cytogenetic response at 12 months was numerically better in the low-risk cohort than in the high-risk cohort, but the difference was not statistically significant. The MMR at 18 months was numerically better for the low-risk cohort than for the high-risk cohort, but the difference was not statistically significant. The positive predictive value (PPV) of the low-risk cohort and the negative predictive value of the high-risk cohort for attaining CCyR at 12 months was 69 and 42%, respectively. The PPV of the low-risk cohort and the negative predictive value of the high-risk cohort for attaining MMR at 18 months was 68 and 40%, respectively. The EFS was 90% in both groups at the end of 2 years. These were inferior compared with those of Hasford et al. , who revealed a PPV for CCyR of 84% and PPV for MMR of 86% . There are several studies on the ability of EUTOS scores to predict the cytogenetic response and outcome of CML patients. These studies have shown inconsistent results and are summarized in [Table 3]. Since Hasford et al. first validated the EUTOS score in 2011, several investigators have attempted to conform its utility. Marin et al. reported that it did not predict the 8-year cumulative cytogenetic response, molecular response, EFS, and overall survival. This has raised concern regarding the effectiveness of the EUTOS score. However, studies by Hoffmann and colleagues ,,,, have concluded that the EUTOS score predicts response and outcome. In contrast, studies by Jabbour et al. and Yamamoto et al. concluded that the EUTOS score did not predict the response and outcome. The present study also showed a similar result. Tiribelli et al. concluded that it predicted the 5-year outcome but not the cytogenetic response. adherence to treatment having an effect on outcome, which was not studied. Other reasons could be variabilities in pharmacogenomic, pharmacodynamic, and genomic profiles among the patients, which may have had a profound effect on response and outcome. The poor predictive ability of this score in the present study could be due to the small sample size and single-center design. In summary, with the increase in available treatment options for pediatric CML patients, there is a gross unmet need in risk stratification, which will aid in therapeutic decisions. The ideal risk score metric should be simple, universally acceptable, and able to clearly discriminate the risk groups with high sensitivity and specificity. The present study did not validate the effectiveness of the EUTOS risk score in predicting the response and outcome. Currently, the usefulness of the EUTOS risk score in stratifying pediatric CML is uncertain. To resolve this issue, new prognostic models incorporating various biologic and molecular features need to be tested in a multicenter prospective study involving the pediatric CML population over a long follow-up period. The authors acknowledge Max Foundation, Novartis Oncology for free supply of Imatinib Mesylate (Glivec) in India. Hu B, Savani BN. Impact of risk score calculations in choosing front-line tyrosine kinase inhibitors for patients with newly diagnosed chronic myeloid leukemia in the chronic phase. Eur J Haematol 2014; 93:179–186. Suttorp M, Millot F. Treatment of pediatric chronic myeloid leukemia in the year 2010: use of tyrosine kinase inhibitors and stem-cell transplantation. Hematology Am Soc Hematol Educ Program 2010; 2010:368–376. Baccarani M, Cortes J, Pane F, Niederwieser D, Saglio G, Apperley J, et al. Chronic myeloid leukemia: an update of concepts and management recommendations of European leukemia net. J Clin Oncol 2009; 27:6041–6051. Hasford J, Baccarani M, Hoffmann V, et al. Predicting complete cytogenetic response and subsequent progression-free survival in 2060 patients with CML on imatinib treatment: the EUTOS score. Blood 2011; 118:686–692. Marin D, Ibrahim AR, Goldman JM. European Treatment and Outcome Study (EUTOS) score for chronic myeloid leukemia still requires more confirmation. J Clin Oncol 2011; 29:3944–3945. Hoffmann VS, Mayer J, Turkina AG, Hellmann A, Indrak K, Steegmann JL, et al. 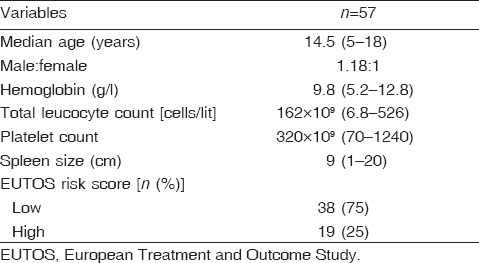 EUTOS score is also valid in CML patients not involved in clinical studies [abstract]. Blood 2012; 120:3759. Jabbour E, Cortes J, Nazha A, O'Brien S, Quintas-Cardama A, Pierce S, et al. EUTOS score is not predictive for survival and outcome in patients with early chronic phase chronic myeloid leukemia treated with tyrosine kinase inhibitors: a single institution experience. Blood 2012; 119:4524–4526. Uz B, Buyukasik Y, Atay H, et al. 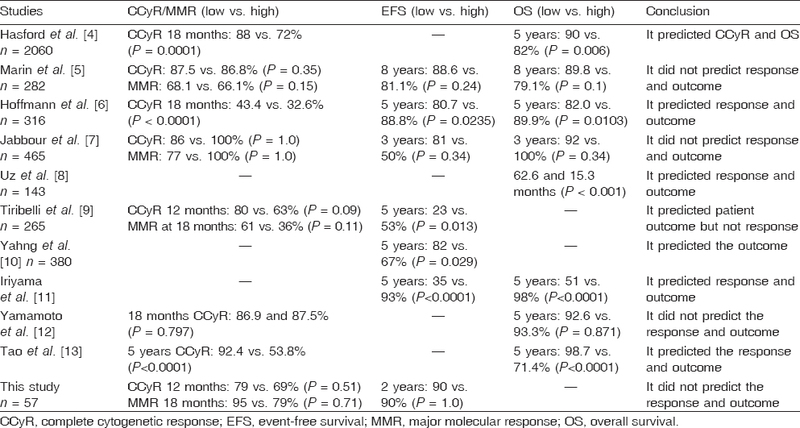 EUTOS CML prognostic scoring system predicts ELN-based 'event-free survival' better than Euro/Hasford and Sokal systems in CML patients receiving front-line imatinib mesylate. Hematology 2013; 18:247–252. Tiribelli M, Bonifacio M, Calistri E, et al. EUTOS score identifies cases with poor outcome in patients with early chronic phase chronic myeloid leukemia, though not predictive for optimal response to imatinib [abstract]. Blood 2012; 120:3778. Yahng SA, Jang EJ, Choi SY, et al. Comparison of Sokal, Hasford and EUTOS scores in terms of long-term treatment outcome according to the risks in each prognostic model: a single center data analyzed in 255 early chronic phase chronic myeloid leukemia patients treated with frontline imatinib mesylate [abstract]. Blood 2012; 120:2794. Iriyama N, Hatta Y, Kobayashi S, et al. The European Treatment and Outcome Study score is associated with clinical outcomes and treatment response following European Leukemia Net 2013 recommendations in chronic-phase chronic myeloid leukemia. Int J Hematol 2014; 100:379–385. Yamamoto E, Fujisawa S, Hagihara M, et al. European Treatment and Outcome Study score does not predict imatinib treatment response and outcome in chronic myeloid leukemia patients. Cancer Sci 2014; 105:105–109. Tao Z, Liu B, Zhao Y, et al. EUTOS score predicts survival and cytogenetic response in patients with chronic phase chronic myeloid leukemia treated with first-line imatinib. Leuk Res 2014; 38:1030–1035.